So smoked "bock" got bottled about three weeks after it started fermenting. I didn't bother with two-stage fermentation since I was using an ale yeast afterall. I've tasted the beer after three weeks in the bottle and this point it tastes more bitter than I expected but I think this might have to do with the oak smoked malt accentuating the hop flavors along with the sharp carbonation. In hindsight, I would use just beechwood smoked malt and no oak smoked malt. I would probably also use more smoked malt for more of that bacon and sausage character. That said, I do like the character of the oak smoked malt but I think that's for another beer -- maybe a helles bock or Grodziskie -- and I really want to try brewing a Grodziskie. I tried a Grodziskie for the first time recently and really liked it. As I'm typing this I'm drinking my dunkelweizen. It comes across drier and a bit thinner than expected but I do like it. It is very carbonated and I think that reinforces the feeling of dryness. I went to a new brewpub last night called Ike and Oak. I really enjoyed their pale ale called Broken Carabiner. I'm not sure if I'll try and brew a clone of that or the Grodziskie next. I really enjoyed the late additions of Mosaic hops in the Carebiner but I think I might still try and get to the Grodziskie...it's just such a delightfully oddball style. I'm brewing for the second time with the Gigawort today. One of the problems I had the first time with the Gigawort was malt extract sticking to the bottom of the kettle which triggered the "run dry" sensor causing the unit to shutdown. I used dry malt extract (or as the English call it, spray malt) this time and had no problem. (Dry malt exract tends to float instead of sink.) The recipe this time is what I'm calling Campfire Bock. The recipe is six pounds of Muntons Dark DME, one pound of Melanoidin malt, one pound of Weyermann Beechwood smoked malt, one pound of Weyermann Oak smoked malt and a half pound of CaraAroma. The beer is hopped with one ounce of 11.4 percent AA Magnum hops. I'm going to reusing the WLP 300 yeast from the last batch and plan to ferment at 64 degrees to keep the esters low. It should be interesting. I've used peat smoked malt before in a Scotch ale but I've never used rauch malt. I'm curious as to how much smokiness 20 percent smoked malt will offer. I think I can mash up to five pounds of malt in the Gigawort so I probably could make a pretty smoky beer as long as the original gravity isn't too high. So after writing the above, I started reading more about smoked beers and I'm kind of fascinated with Grodziskie. I'd like to try brewing one someday. Here's a link if you haven't heard of this style before. Well today was a big day in the history of my homebrewing hobby. I bought an electric brew kettle last week and after a test run last night of plain water, I decided to brew today. The electric brew kettle is a a Gigawort from Northern Brewer, a four-gallon kettle that operates at 600W and 1600W. The lower setting is used to hold temps while the higher setting is used to keep a rolling (and I do mean rolling) boil going. I chose to brew a dunkleweizen since I haven't brewed that style before (or maybe I did once a long, long time ago.) The recipe was simple: the Brewer's Best Dunkleweizen kit with wheat DME used in place of the maltodextrin. Although I'm happy to no longer be brewing on the stove, the Gigawort is not without it's problems. Perhaps problems is too strong of a word. It's a finicky unit. The Brewer's Best kit included two cans of LME and it seems to stick to the "run dry" sensor at the bottom of the kettle which caused the temperature controller to register and E4 condition. This E4 error shuts down the heating elements and requires the brewer to push a reset switch underneath the unit, a maneuver that is a bit tedious with the kettle full of hot wort. 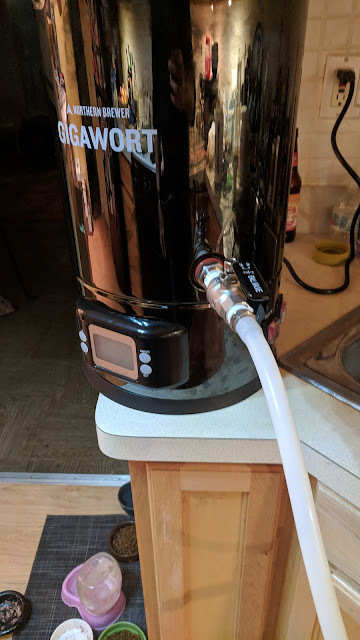 I had to reset the Gigawort three times before it was able to keep a roiling boil. I also had to shutdown the unit once to prevent a boil over. Despite these issues I was able to complete the boil and cool with my copper immersion chiller. The chilling took about an hour to get the wort down to 63 degrees. I pitched White Labs WLP 300 Hefeweizen yeast and wanted to do a cool ferment at 66 degrees (accomplished using a Brew Jacket) to bring out more of the clove than banana esters. I did not use the dry yeast that came with the kit. A little more about the Gigawort: it took quite a bit of work to get the bulkhead attached to the kettle. I'm not a very good plumber though, so your mileage may vary. Also, when brewing partial mash beers I will probably stick to using only DME and not LME as I think it would less inclined to stick to the bottom and trigger the "run dry" sensor. 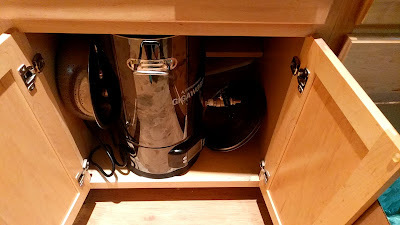 One very nice thing about the Gigawort as that it fits under my counter in on of my kitchen cabinets. 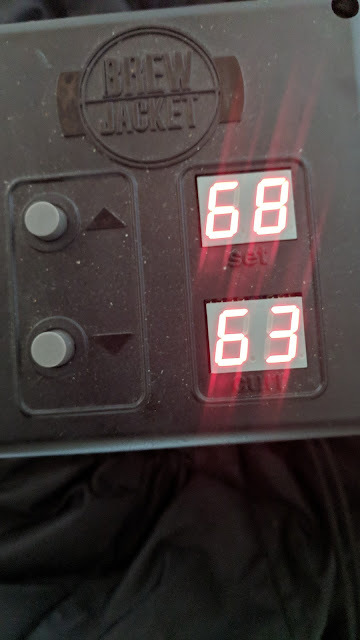 Pictured below is the wort temperature detected by the Brew Jacket (the bottom number is the wort temperature and the top number is the thermostat setting.) I later dropped the set temperature to 66. 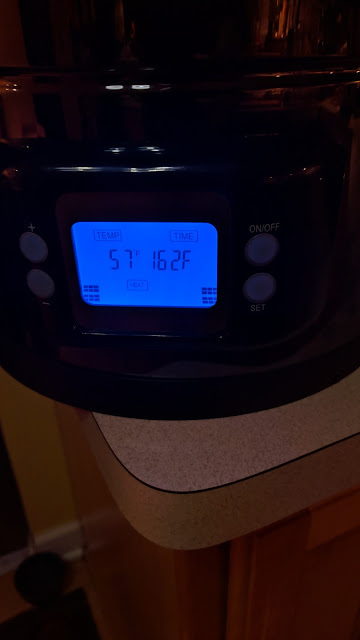 Below that is a picture of the Gigawort in it's new home, a pic of the kettle on my kitchen counter next to the sink and a pic of my test run with the controller showing a 57 degree water temperature and set temperature of 162 for mashing. It ended up holding around 156 which was perfect.